​Gemeinschaft Home began as a residential, transitional facility for individuals who have been released from incarceration and have a probation obligation with the Virginia Department of Corrections (DOC). While we have maintained our re-entry program for (ex)offenders for the past three decades, Gemeinschaft Home now offers two additional services--the Day Reporting Center and the Self-Pay Program. Organized in June of 1985, Gemeinschaft Home launched with seven residents. In previous years, the Victorian-style house, located on Mt. Clinton Pike just west of Eastern Mennonite University, had been the home of several EMU students who lived in an intentional community called "Gemeinschaft." The house was later remodeled in 1993, increasing the capacity from 17 to 22, which added a recreational building with a classroom and offices. In November 1995 Gemeinschaft began management of Piedmont House in Charlottesville, Virginia with a capacity of 19 beds. By mutual consent, Gemeinschaft Home and Piedmont House separated July 1, 2001. One of the student residents from that era was Barry Hart, MDiv ’79, now a professor of trauma, conflict and identity studies at EMU’s Center for Justice and Peacebuilding. 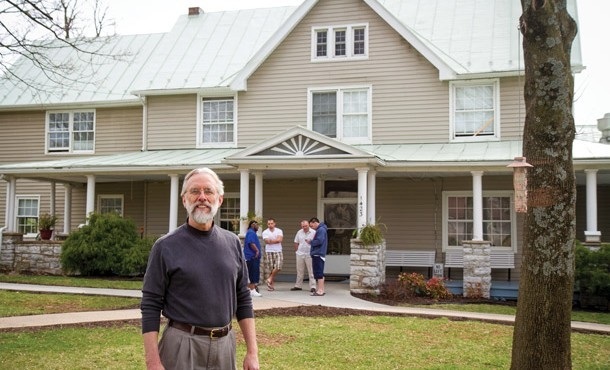 After finishing his seminary degree, Hart bought the house with two others with the intention of founding an intentional Christian community that welcomed ex-offenders.